Recipe for Hot Cross Buns a traditional Good Friday baked sweet bread. This version is a twist on the original with vanilla, cinnamon, and cardamom flavored buns, raspberry piping and a honey glaze. Buns will stay fresh at room temperature for 2 days or refrigerate for up to 6 months. I am making Hot Cross Buns today, so that can only mean one thing..it’s Good Friday and Easter is on it’s way!! Yay for Spring, flowers, sunshine, and time spent outside. For my buns I decided to leave out raisins and just go for flavoring. Pink always reminds me of fresh flowers so naturally a pink cross made from raspberry came to mind. The berry flavor marries well with the other spices creating a zingy sticky bun. I never count how many I eat, so that means you shouldn’t either! 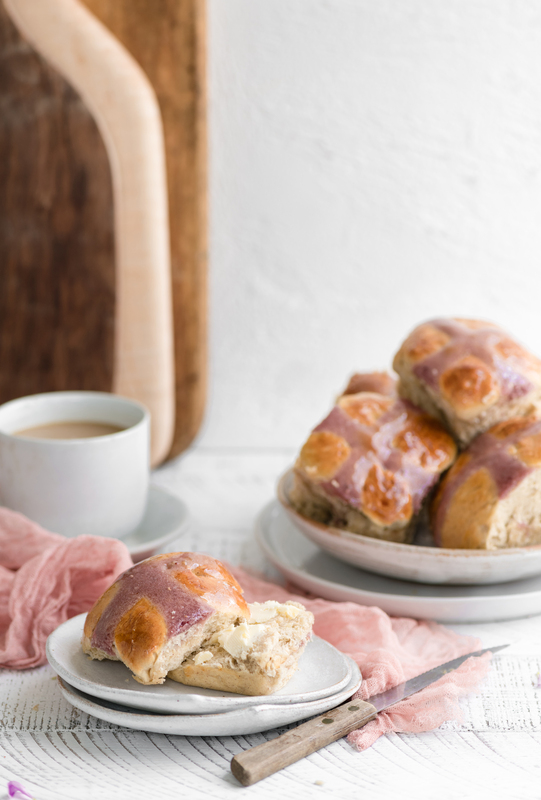 Hot Cross Buns are said to date back to the 12th century, when an Anglican Monk baked sweet buns and marked them with a cross in honor of Good Friday. These sweet and recognizable buns are now an Easter baking tradition. 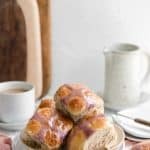 Are Hot Cross Buns Bread or Cake? They are most definitely a sweet bread. 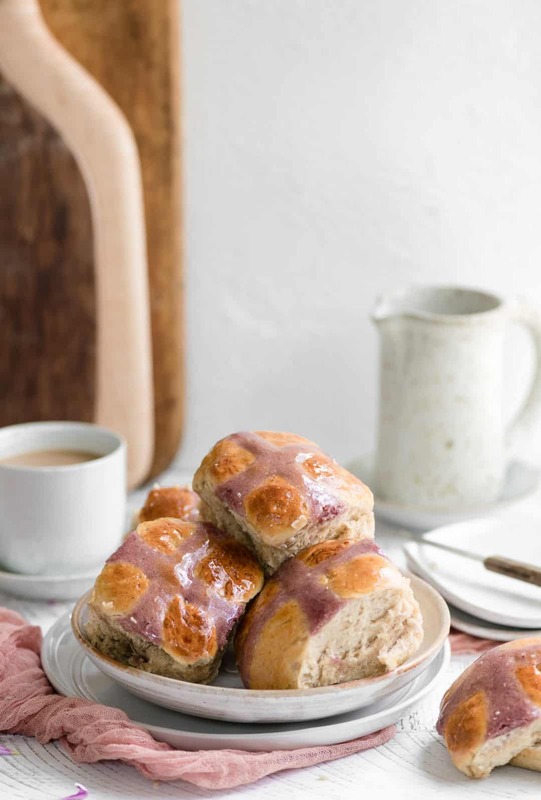 The Hot Cross Bun recipe uses yeast as a rising agent instead of baking soda or powder. Once your sough is mixed it needs time to proof and rise like a bread in order to create a pillowy texture. 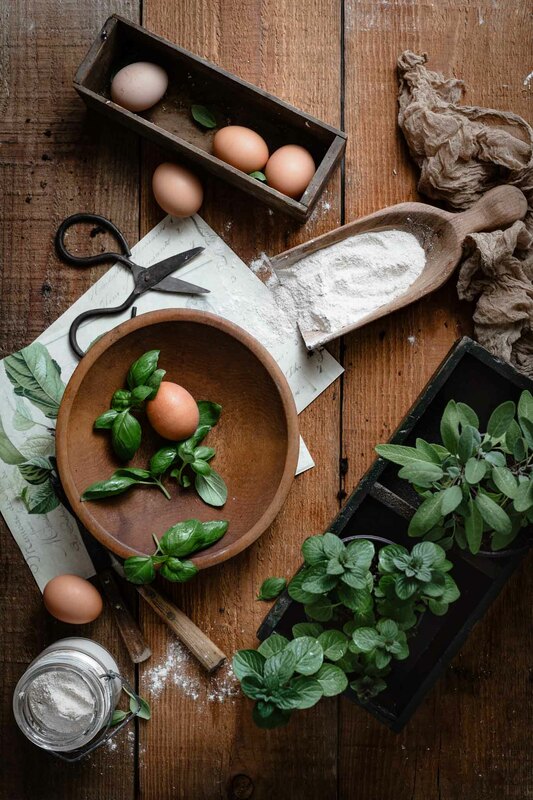 Whisk together sifted flour, sugar, cinnamon, cardamom and salt in a medium bowl. 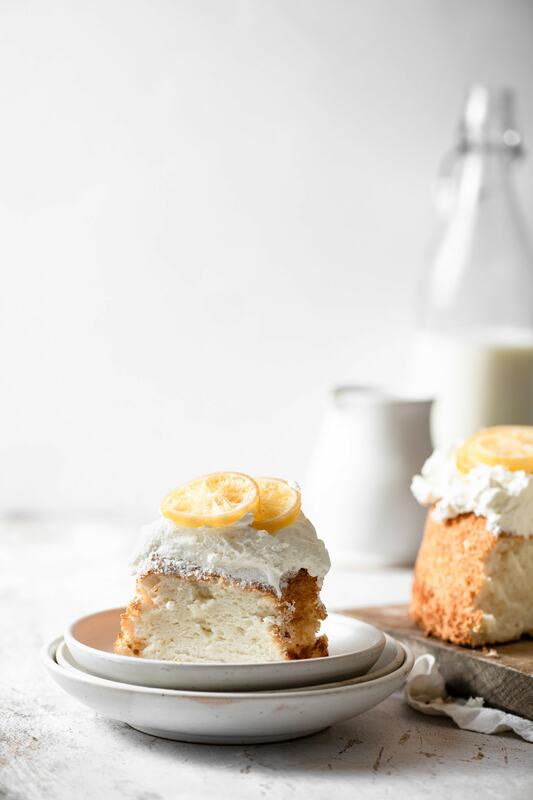 In a separate bowl mix together melted butter, almond milk, honey, and vanilla. In bowl of stand mixer, add warm water, I tsp of raw sugar, and yeast. Stir together gently with spoon and let sit 5-10 min until foamy. Once yeast is ready, pour in milk mixture and combine on medium speed with paddle attachment. Add in the two eggs and mix again. Switch to dough hook attachment and at medium speed slowly spoon in flour mixture. Dough should start to form. Make sure not sticky but smooth texture. Remove dough from mixer and place in a lightly greased bowl. Cover with plastic wrap and set in a warm place for one hour to allow dough to ride and double in size. Spray or line a 9x13 rimmed pan. Remove dough and place on a lightly floured surface. Punch down dough to remove excess air. Place balls in 4X3 rows almost touching onto the pan. Cover with a tea towel and set aside for an additional 30 minutes to puff. During this time make your raspberry piping. Brush the surface of the puffed buns with egg wash before piping. Stir together raspberry preserves, flour, and water until a thick pink paste is formed. Transfer paste to a piping bag. Using either a Wilton #10 piping tip or cut just the very tip off the end of the bag. In a smooth continuos motion pipe cross pattern across rolls. Start from the top of each row and cover all buns in that row at once. Remove Hot Cross Buns from the oven and while hot immediately brush on honey glaze. Set aside to cool for 10-12 min before serving. Raspberry preserves can be substituted with other fruit flavors or just use water plus flour for traditional white crosses.